Coron has a wide range of dive sites to suit all levels of dive experience, from shallow to advanced wreck diving there is something for everyone. The main attraction however is undoubtedly the wrecks of the Japanese supply fleet sunk in September 1944.
e large at 9723 tons, 146.9 metres in overall length and 19 meters wide. The engines,two steam powered turbines (8300 shp) driving twin propellers provided a maximum speed of 17.5 knots. The Irako (along with the Okikawa) is debated to be best wreck dive in the Philippines. The Irako almost completely intact and has very good visibility you know yo u are on a big shipwreck. Big schools of yellow fin tuna, groupers, lion fish and scorpion fish surround this wreck. To date two permanent residents (2 sea turtles) live in the crumpled superstructure. There is also a huge column of Jacks inhabiting the bow area. There is a beautiful deep penetration dive through the engine room for well trained, properly equipped divers. Due to it’s location, The Irako usually has the best visibility of all the wrecks in Coron Bay. de breathing 32% Nitrox for a 50% increase in allowable bottom time. Penetration of the interior requires 28 -30% Nitrox depending on which deck level you wish to swim through. The Maximum depth of the Iraku is 43 meters at the bottom, the deck level is between 28 to 35 meters. Recommended certification level: Minimum: Advanced Open Water Diver, Best certification :Deep Diver Specialty, Wreck Diver Specialty. The Akitsushima a Japanese Seaplane Carrier is located at N 11*59. 218′, E 119*58. 417’The Akitsushima was a seaplane carrier with a displacement of 4724 tons, a length of 118 meters and was 15.7 meters wide. Powered by four diesel engines driving twin propellers, creating a total of 8000 shp, and producing a maximum speed of 19 knotsAkitsushima was also armed with 10 piece, 25 mm anti-aircraft guns, four piece five inch (50 cal) guns and carried one large Kanwanishi flying boat.The Akitsushima was a large warship, now laying on her port side. She was struck by a large bomb close to the stern where the flying boat rested on the metal tracks and sank immediately. The ship was almost torn into two pieces. The flying boat disappeared upon impact.The crane used for lifting the seaplane is still intact. The crane is lying on the sandy bottom and attracts schools of batfish and barracudas and the odd grouper. One 3-barreled AA (anti-aircraft) gun is still present at the front of the flying boat tracks. This is a fascinating dive where you can see all sorts of marine life around the wreck.Due to the depth and various jagged metal hazards within, no dives (swim throughs) are allowed without a wreck diver certification. Wreck divers can make an impressive penetration into the engine room to see the four engines and the gears and machinery for operating the crane are the main objects of interest for a penetration dive.This dive is best made using a 30% or 32% Nitrox mix for a 50% increase in allowable submersible time.The Akitsushima maximum depth is 35 meters, the average depth is about 25 to 29 meters. Recommended certification level: Advanced Open water Diver. For penetration: Wreck Diver specialty. The Kogyo Maru is located at N 11*58. 782′ E 120*02. 413′. 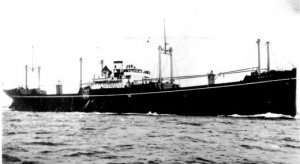 She was a Japanese freighter carrying construction materials and building supplies for the Japanese war effort in the Pacific. The Kogyo Maru was 6353 tons, 129 meters long, and 18 meters wide. She was powered by two steam turbines (517Nhp) geared to a single shaft.The Kogyo Maru is presently lying on her starboard side in 34 meters of water. 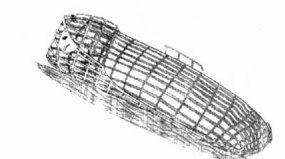 It offers dive (swim throughs) into all six holds and through the engine room & bridge area.The Kogyo Maru’s second hold contains an incline of concrete bags which collapsed as the ship sank. A small bulldozer draws attention as you swim into the hold, complete but totally encrusted with coral, You can swim over the deck to the bridge and engine room below. Enter both from the stern for easier access. Swim through the spacious engine room and look around then exit out through the bridge. If you have enough air go below deck level to the stern and see all of the machines and equipment for moving cargo on the ship. You will see both hard and soft corals covering the side of the ship.This dive is best when made using 30% or 34% Nitrox for a 50% increase in allowable time. If you have enough gas mixture and a long enough No Decompression Limit you can cover the whole ship on one dive.The Kogyo Maru’s Maximum depth is 34 meters, average depth 24-26metersRecommended certification level: Advanced Open Water, Wreck Diver Specialty. The Olympia Maru was a Japanese Freighter sitting upright in approximately 30 meters of water and located at N11*58. 291′, E 120*03. 707’SThe Olympia Maru had a displacement of 122 meters long and 17 meters wide, weighing 5612 tons. The ship was refitted between June 2nd to August 2nd, 1930, with an oil two stroke six cylinder engine producing 582hp. The ship was requisitioned by the Japanese Defence Forces during the War but was still owned by Mitsubishi Shoji Kaisha Ltd at the time of sinking.The Olympia Maru is a very good dive site with an abundance of marine life. Large schools of banana fish, giant bat and puffer fish lurk around the wreck. Easy penetration and a good opportunity to discover wreck diving. This is a great dive using 33 – 36% Nitrox for a 75% increase in allowable submersible time. The Olympia Maru’s Maximum depth: 30 meters, deck level 18-24 meters. Recommended certification level: Advanced Open Water Diver, Wreck Diver Specialty. The East Tangat Gunboat was a small gunboat or submarine hunter 40 meters long on the coral reef on the east side of Tangat Island.The East Tangat Gunboat dive site is good for wreck diving beginners snorkelers and underwater photographers. It’s also a lovely spacer dive between deeper wreck sites. The wreck starts at only 3 meters down so even snorkelers can see the shape and explore the bow of the ship.The East Tangat Gunboat dive maximum depth: 22 meters. Recommended certification level: Skin (snorkel) Diver, Open Water Diver. 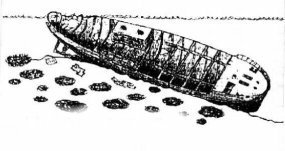 The Lusong Gunboat wreck, like the East Tangat wreck, was also a gunboat or submarine hunter. The stern breaks the surface at low tide and is located in front of the east side of Lusong Island at N 11*58. 260′, – E 120*01.447’The Lusong Gunboat wreck is great for snorkeling. It is nicely covered with hard corals and offers a huge variety of aquatic life. There are good opportunities for wreck photographers and this dive is good as a “dive between dives.”Lusong Gunboat maximum depth: 11 meters. Recommended certification level: Skin Diver, Open Water Diver. This wreck is the keel, ribs and stringers of a steel-hulled boat about 25 meters long. Not much to see when you have been diving with “The Big Boys (wrecks) ” It’s on most of the island hopping and snorkeling tours so expect crowds. its located on the Northwest corner of Coron IslandThis wreck was beached with the bow 12 meters from Coron Island. The stern points away from the island. The wreck’s 5 meters deep at the bow to 22 meters at the stern. A pass through on the starboard side of the hull at 14 meters allows you to swim from the inside of the boat out over the coral reef.Maximum depth: 22 meters on the bottom. Slopes from 7 to 22 meters. Recommended certification level: Skin Diver, Open Water Diver. The “Dive Review” a collection of diving testimonials kept at Hub Backpackers Hangout Hostel for Divers in Coron has the following reviews of Barracuda Lake:“A must do Dive”“One of the most Bizarre dives in the Philippines.”“See the thermal layers and do underwater climbing”Barracuda Lake is located at the North end of Coron Island. 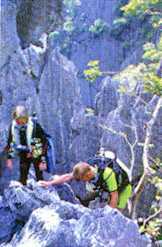 This amazing dive starts with some challenging mountain climbing, sometimes in full diving equipment, over sharp limestone cliffs. Wear tennis shoes or sandals and carry your fins on your tank. The climb only takes 10 or so minutes and the exertion is worth it. The scenery is spectacular and the underwater terrain is some of the most interesting you will see anywhere on the planet. The top 4 meters is warm fresh water and below 4 meters the water is saline. There are dramatic changes in water temperature from 28 to 38 Celsius. You can even see the thermoclines at 4 and 13 meters. At 34 to 35 meters the water changes from crystal clear to medium brown. If your lucky, you might even see the local resident barracuda approximately 1.5m long that likes to guard this majestic domain. This is definately a dive that you should not miss!Barracuda lake’s maximum depth: 35 meters.Recommended certification level: Open Water Diver, Mountain Climbing Diver Specialty. 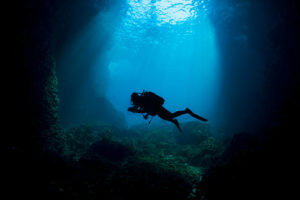 There is a very deep cave in Barracuda lake entered at a depth of 33 meters. The cave has been marked with a guide line on the right side as you enter. The cave is large enough for only one diver to swim in and turn around at a time so please wait your turn. The silt and sediment on the bottom is packed and should remain undisturbed by the diver. This cave is quite dark and the sediment is also quite which gives it an eerie sensation. Proper dive equipment would include a light and at least an octopus with a 7-foot hose or other secure source. The current tells you that it is connecting Barracuda Lake to the ocean. This is a dive that you should not miss but you must make sure you are prepared..The Cave Maximum depth: 40 meters, please use extreme caution below 40 meters.Recommended certification level: Limiting your penetration dive to 40 meters total distance from the surface (a 6 meter penetration) then Advanced Open Water Course with Deep Diver Specialty or Cavern Diver Specialty should be enough. 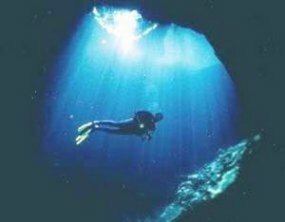 Should you plan to penetrate beyond 40 total meters from the surface then you should be a Cave Diver with extensive experience and carry the necessary safety equipment. The Cathedral cave under Coron Island, Palawan and directly connected to the sea. It’s located on the East side of the South end of Coron Island.Cathedral Cave is a fantastic dive spot. It starts at6 meters deep at a hole next to the sheer rock wall of Coron Island. You enter a tunnel and descend to 13 meters.Then you pass out of the tunnel and see a ray of light that penetrates the interior of a cave. The skeletal trunk of a sunken tree and main branches of the tree rest on top of a sand mound in the middle of the cave. Following the light you pass over the sand dune and continue ahead to the left towards another passage that leads to a chamber with an air pocket above sea level. Again back through the tunnel into the open sea where you dive among the beautiful corals with great visibility. Cathedral Cave MUST ONLY BE ATTEMPTED in calm weather never attempt to enter the Cave in a storm surge and large waves.Don’t miss it !Maximum depth: 10 meters inside the cave. 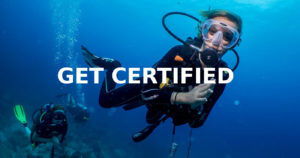 Recommended certification level: Advanced Open Water with a Cavern Diver Specialty. This is a Civilian tanker 834 gross tons, also called “The Black Island Wreck” it can be easily identified as a small tanker the ship is approximately 50 meters long sitting upright on a sandy bottom.Located close to Black Island Beach this wreck is 3.5 hours away from Coron and can be dived as a day trip with a 7 am departure or an overnight dive. This dive site is a fantastic wreck dive for beginner wreck divers as it is a beautiful dive in clear water with plenty of scorpion, lion, trumpet, groupers, and batfish.This dive maximum depth: 31 meters. The wreck starts in 21-meters of deep water. Recommended certification level: Advanced Open Water Diver, Wreck Diver Specialty. 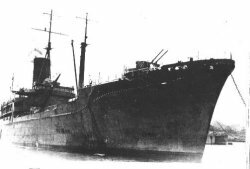 The Kyokuzan Maru was a Japanese freighter approximately 160-180 meters long. it’s location is Northeast of Busuanga Island. The easiest way to dive this wreck is a one hour van ride to the north end of Busuanga then transferring to a rented dive boat. This is done as an all-day trip for two dives on the Kyokuzan Maru or maybe better for an extended stay of a couple days.This wreck is a beautiful dive. Mainly intact, this sunken ship usually offers great visibility of about 20 meters and ideal diving conditions. Japanese staff cars and trucks can still be found in the cargo rooms.This dive is best when made while breathing 36% Nitrox for a 75% increase in allowable dive time.The Kyokuzan Maru’s maximum depth is 40 meters at the bottom. The deck level lies between 22 and 28 meters. Recommended certification level: Advanced Open Water Diver, Wreck Diver Specialty.